Leffe Vieille Cuvée | Abbaye de Leffe S.A. Chilled 330ml bottle poured into a Leffe chalice glass. Body is a rich and bold dark amber with an almost perfect looking 3-fingers of creamy head that falls away gradually to a rocky uneven surface with sticky lace. Aroma is focused on sweet dark fruits like plumbs, raisins and grape. Malt and spicy yeast also feature. Taste begins with a bitter hop taste with roasted malts, burnt honey, roasted malt and mild espresso flavors. Vaguely moderate balance with a medium degree of carbonation. This and the Tripel are possibly the best of the Leffe range in my opinion. Served in a Leffe chalice, it pours a clear copper, closer to orange than red. It forms a thin layer of head, light brown, with small retention. Nice sweet bouquet. Lots of banana esters, caramel, raisins, red apple, and a slight herbaceous note. Spicy hoppiness after swirling. The flavor follows the nose and expands on it. Caramel, molasses, prunes, raisins, banana and medicinal phenols. Mid flavor some bitterness enters and balances the sweet notes, and that bitterness grows the warmer the beer gets. Bready, banana aftertaste, with a caramel sweetness and that bitterness coating your palate too. It lingers long. Medium to light body, smooth, high carbonation. Very pleasant mouthfeel. Interestingly enough, this beer's recommended temperature is 5°C, much more chilled than its usual counterparts within the belgian dark strong ale style, and you do appreciate more notes and depth in this beer the colder it is. This beer will be better if alcohol were a little less noticeable, overall, an ok beer in every aspect. Must add that is good for hot days. Deep ruby/brown. Head is tight, creamy and sustained. Rich aroma of raisins, prunes, dark bing cherries & alcohol. The dark ripe fruit is the predominate flavor with some alcoholic undertones but overall the alcohol is masked quite well. I thoroughly enjoyed this brew. In fact, I snuck in a Chimay Red in between two of these and IMHO, the Leffe was clearly fuller flavored. This and the Radiusse are impressive beers. Quite good, but sweeter than i would like, and not overly complex, has a sort of toffee and slightly spicy flavour, reminded me of a less characterfull (is that word?) version of Kwak, very enjoyable in the end. (33 cl bottle, bought in Denmark). Deep golden brown colour, no haziness, large head. Aroma is not very strong, but pleasant - yeasty and fruity (canned plums), some spices and herbs too. Full bodied sweet flavour, still quite smooth. Brown candy sugar, Christmas fruit cake spices and herbs prevail. Some alcoholic warmth, but not dominant. A great sipping beer! This beer appeared as a new offering at the local supermarket, just in time for Christmas. The brew is a ruddy brown color with a tan head and considerable lace. It's a nice looking glass of beer. The aroma is great...lots of mixed spice and malts. There's an herbal, peppery, phenolic, yeastiness in the aroma that's backed by a touch of ethanol. There's a touch of distant ripe fruit, but also very discernible bitter chocolate, in the aroma. The taste has a lot of malt presence, along with sugar and an omnipresent alcohol warming. Relatively smooth with a medium body. Pepper and phenols in the finish. Long and lingering aftertaste. This is a very enjoyable and contemplative beer. Dark violet color, flirting with brown, with bright crimson poking through the cracks, adorned with a large, fluffy white head. Aroma: Bam! Big fruit explosion, wild and tasty, winey,and bit sour, a little sharp, juicy, hoppy, and over-all dominated by grape flavor. tingly on the tongue, vibrant, and again, juicy is a most appropriate adjective. Fruit all up in the yin-yang, folks. A bit light-ish in body, with great hops, excellent balance, and eminently drinkable, tantalizingly tasty. Full-flavored, rich and bountiful, rosey, happy, delicious. Great desset choice, if you're lucky enough to try one. Large thanks to jeffboo for hauling this bottle over from merry old Europe for me! Saw and bought it for the first time in Lugano, CH.Very dark red tone which seems almost fully opaque but not too dense. the smell is dominated by its sweetness, from the malt, but is also very spicy and inviting. The flavour is a very, very broad and spicy blend that mixes and triggers in your mouth, ranging among several different sensations among which the overwhelming sweetness- excessive, IMHO, dominates and rather renders it overall a bit less gratifying. still, worthy of a repurchase. nice overall. Dark, dark amber with off-white clotted lacing. Dark bread and tree bark. Honey flavor, w/o being overly sweet. Complex variations on dark malt and dried fruit (past expiration date dried fruit). Baroque in complexity. Roses. Nice rich mouth feel. For all of that it just does not add up to a drink I will be reaching for again. Bought this in Venice, Italy, and drank it in Lucerne, Switzerland. Clear, dark amber with caramel highlights, forms a moderately dense beige head with flocculent clusters atop medium sized bubbles with good retention and good lacing. Carbonation is moderate. Aroma is spicy with phenolic cloves, bananas, and a slight amber earthiness. No alcohol is evident, and the aroma is not distinct from the other Leffe beers I've had. Mouthfeel is immediately spritzy upon the tongue with a wet finish and medium body. Taste begins with spicy cloves and herbal hops, fading into a ruddy hopiness, a hint of nickel, followed by a warming estery alcohol, and finishing in a earthy wheat malt with mild balancing bittering hops and somewhat cloying mouthfeel. Alcohol is barely perceptable, but gives one a pleasant buzz. This is a well-made brew, but the ruddiness halfway through limits its drinkability. Bottle: Poured a deep burgundy and brown color ale with a great big foamy head with some good retention and some lacing. Aroma of candi sugar with some nice Belgian malt. Taste was to be honest a little bit disappointing with a watery body and a unrefined sugar taste that didnt do much for me. The body is watery with some great carbonation and a nice creamy texture. Im not the biggest fan of this brewery but I have to admit that this beer featured some great characteristics but lack some cohesion and a malt profile to hold the whole thing together. pours with a fluffy, beige, 1cm head, and a nice clear, dark amber color. sweet aroma of ripe dark fruits. almost an intense concentrated goldings-like smell. no obvious sign of alcohol on the nose. taste is sweet maltiness turning to alcohol warmness as the temp rises. mouthfeel starts bubbly, but carries a filling thickness as the end nears. a seriously full beer all around. good or bad, it would be difficult to stuff anything else in. Clean red/light purple with a nice creamy head and good carbonation. A spicy sweet clover aroma heads out first follow by crisp malt and fruity notes. Other deep herbs and spices in a very complex nose. What a satisfying taste. Dry, slighty tart and bitter with deep flavours that last. Similar spicy fruit flavours with a metallic touch on the aftertaste. I really enjoy the Leffe range of beers, with this being no exception. Dark Belgium, somewhat aged which minimizes sweetness of caramel. Pours dark with a modest head.Fresh spiciness in nose. Drinks smooth, dark, balanced, interesting, with malt and spice. Drying finish. Medium mouthfeel. A good Belgium, and beyond the normal Leffe servings. ABV unnoticeable but clubs you over the head later. Pours a dark amber color with about 3 inches of chunky head that sticks around for a while and laces the glass. Smells estery and yeasty, with hints of cloves and citrus. Tastes very sweet, malty & woody with some estery fruitiness in there. Very tasty. Mouthfeel is heavy and a little creamy, but with a lot of carbonation burn on the tongue. Finishes very cleanly. All in all, a very drinkable beer, once again Leffe hasn't let me down. A fresh, best before 24/03/08 brew. Whoo, a opaque brown, make that black, pour capped by a frothy, sticky tan head. Fresh! Quite an unique aroma, malty, yes, but mixed with a pilsner like euro yeast. Sweet caramels, Belgium yeast, sugar cane, banana, orange and malt grace the quaff, even some lite coffee notes. Geez, every brew I get envious of the Belgiums that get to enjoy this on an everyday basis. Dry and crisp, this is just top shelf stuff. Man, I need a case of these bad boys. At 8% I could sip these all day, albeit slowly. Thanks to my great son, studying overseas in Amsterdam, I was sent this for the unique chance to enjoy. 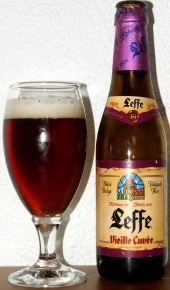 Leffe Vieille Cuvée from Abbaye de Leffe S.A.